Traffic on the Ellsworth Street bridge one day in October 2017, while the streetscape construction was going on downtown. Traffic congestion in North Albany has been a topic before the city council and the planning commission lately. The message as I understood it: There’s nothing much that can be done. Tuesday night was another of those evenings when inbound traffic on Highway 20 was stacked up past the curves, as drivers from Corvallis, from North Albany Road and Spring Hill Drive all converged trying to get over the Ellsworth Street Bridge. The contractor on the downtown “streetscape” project was working on Ellsworth. Transportation Systems Analyst Ron Irish told the council at a work session last week that the downtown streetscape project was the cause of more frequent congestion on Highway 20, sometimes backing up to near Hyak Park. Delays because of slower traffic through downtown should ease when the project is finished later this year. As for North Albany intersections, even though there are delays especially during peak traffic in the morning, all the intersections now meet the performance standards the city goes by. At the North Albany/Gibson Hill roundabout, Irish blames problems on the uneven distribution of traffic, most of it inbound on Gibson Hill. Roundabouts work best if traffic on all roads feeding them is about even. But at this one, things won’t change until North Albany Road is extended from its current terminus westward to link up with Crocker Lane. That connection could take some of the traffic now using Gibson Hill, but according to Irish, because of wetlands and so forth, that link would probably be the most expensive road the city would ever build. The implication: Don’t hold your breath. There’s been talk for decades about a third Albany bridge across the Willamette, supplementing the two bridges completed in 1925 and 1973, each carrying traffic one way only. Albany officials once thought the third bridge — probably downstream and feeding Conser Road in Millersburg — would solve the problem by taking drivers headed for I-5 northbound off the Highway 20 route through downtown. More recent modeling, though, according to Irish, has raised doubts about the benefits. In any case, a new bridge near North Albany would cost hundreds of millions and is not in the offing. One potential change — twin left-turn lanes from Spring Hill on Highway 20 — would help a little. But ODOT won’t allow it because of the super elevation of the highway curve there has contributed to trucks turning over. ODOT might some day fix that but has made no move to do so. What about stopping new housing subdivisions in North Albany to prevent more traffic? State law apparently allows holding up development projects for six months, but during that period a solution has to be worked out and then the project must be allowed to proceed. Fat chance of finding traffic solutions in that short a period of time. Businesses don’t want a bypass. And the so-called beautification project is a waste of money. Drove home from Corvallis today around 4:15. 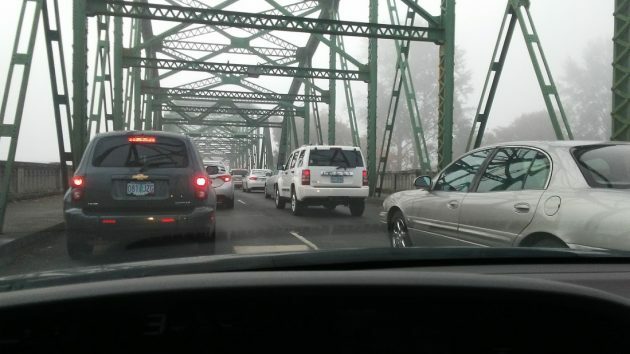 Took me 35 minutes to get from Hyak Park to over the bridge. Crazy and getting worse. Also there was another T-Bone wreck at Hwy 20 and Granger Road this morning. Thanks, Hasso, for the traffic report. I have long wondered why there wasn’t a two lane left turn off of Spring Hill. Your answer clears that up. There was a twin turn lane not all that long ago, but they stopped that due to the big trucks. Thank you, Mr. Ashworth, for chiming in that the beautification (Albany downtown streetscape project is what you mean, I take it) is a waste of money. I agree. But, I am female and get verbal abuse from on high at city council when I chime in. Trucks should be required to use the intersection at NA Rd to Hwy 20 anyway. That would eliminate the tipping over and allow the twin turn lanes for everyone else turning off Springhill to the bridge. I wonder what First Responders have to say about the bottled up traffic. How in the world do they make it through?! My hunch is that the completion of downtown road construction – whenever that is – will relieve some of this congestion. I’ve also observed that the left lane of Ellsworth backs up due to cars turning left on 2nd. Perhaps City and ODOT could fix this issue. I’ve wondered at times whether a third lane on Ellsworth through part or all of downtown, might help traffic flow. Another option for N Albany residents: move out of Albany. It’s not very practical for most of us, but I’ve often fantasized about getting out of both N Albany and Benton County (bye bye too high property taxes) and getting into W. Linn County near Corvallis. One set of problems for another (Hwy 34), but still, it’s an option. Let me get my hanky out to dry my eyes. Those poor N. Albanians just brings tears to my soul. It’s not a problem for those that live in North Albany (especially once the IGA opens). If they live in North Albany they don’t need to get over the bridge at “rush hour”…duh. It’s all those living in Albany and working in Corvallis. How about they move to Corvallis? Problem solved. I don’t think 2 turn lanes from Springhill to HWY 20 helps. If you are turning onto a backed up road it doesn’t matter if there are 1 or 2 turn lanes. All having the 2 left turn lanes accomplished was slowing down people trying to turn right from Springhill onto HWY 20. Why not the 3rd bridge? It makes the most sense and promotes growth between Albany/Millersburg. I’m sure the county wouldn’t mind the continued tax growth with the population explosion in that direction, why not keep it going? Bring an overpass with on/off ramps at Conser to bridge it with Berry and I5 while they’re at it and remove the overpass to nowhere just to the north. Clean house and do the right thing for long term planning now instead of throwing money and everyone’s sanity into the wind. Eliminate the left hand parking lane on Lyons and make that a dedicated left hand turn lane. There are parking lots around the corner east and west of Lyons. Maybe eventually get rid of all on street parking downtown and build a garage. But here’s the thing; if you’ve moved to North Albany in the last 20 years (and I am one of that vast number) then you have no right to complain about traffic, noise, congestion, or beloved trees getting cut down, or open spaces going away. I think you mean Ellsworth, not Lyon. It is Ellsworth where slowdowns due to left turns onto Second sometimes cause upstream congestion. Woah! The congestion is still here but where did my old HH-Today go???? As far as changing Ellsworth to three lanes what happens to the “Pedestrain Friendly” bump outs? Quit complaining – you moved into N.Albany and should have had your eyes open at that time and asked those living here ahead of you what the problems were. For us way out North Albany who use I-5 for commuting it would be wonderful to have a bridge from Springhill to Conser Rd. Then again, I often find myself reminiscing about how North Albany was the country back in the 70s & 80s. My grandparents built their home in the late 40s out here in North Albany. Now I just pretend all the growth isn’t really there LOL. Once the construction is done, it will settle down. We need to remember it’s bad right now because of a temporary situation. That said, I’ve lived many other places and calling this traffic bad is a bit much. Everything’s relative, and this isn’t nearly that bad. The city knew this was coming 15 years ago and should have backed off the high density zoning requirements at that time. My two bits would be to lengthen the cycles and timing of green lights for inbound traffic to allow greater volumes of cars through downtown. The current red light stops at extremely high traffic times are stifling and do not enhance flow. In addition, two right turn lanes from 1st Street right onto Lyons would relieve some of the long wait times outbound when ‘rush hour’ traffic gets backed up 5 blocks and you have to endure 3 light cycles just to get out of town. Try driving on through Ellsworth on a Friday evening about 6pm, destination Freddie’s. Take the main route or try to beat traffic going down Second. Better still, get really sneaky and turn onto Queen at Pacific. This Albany resident has tried them all, and all are equally congested, for about a couple of hours. If only there was a grocery store in West Albany…with a hardware store and a small garden center.